The Angry Birds phenomenon will not stop rolling on as Rovio has announced plans to air "Angry Birds Toons," a series of animated shorts based on the game, through its own video distribution channel. Starting March 17, anyone with a variation of the Angry Birds app (regular, Star Wars, etc.) will be able to watch the episodes directly from a new channel within that app on their iOS and Android smartphones and tablets. 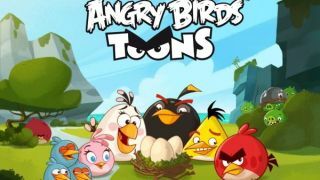 "Angry Birds Toons" are also slated to appear on various on-demand entertainment channels around the world on March 16, but the concept of distribution through a gaming app is certainly new and untested waters. There will be 52 episodes (one new episode airing every week for a year), with users able to access the videos through a new button on the Angry Birds homescreen, which will arrive in an update next weekend. The real kicker though is just how far and wide the grasp of Angry Birds has spread since its inception in 2009. If you can believe it, Rovio CEO Mikael Head revealed the various AB apps have been downloaded 1.7 billion times, making in-app distribution all that more attractive. "We've long wanted to tell our fans the story of the Angry Birds and the Bad Piggies, to introduce their personalities and their world in detail," Hed said in a statement. "We're delighted to introduce all this through our new channel, with easy and instant access to the stories in the palm of your hand." With over 1.7 billion downloads, we can reach a far wider and more engaged global audience than traditional distribution would allow." Rovio partnered with Comcast, Samsung and Roku in the U.S. to air the latest adventures in the saga of those crazy birds and piggies, as well as international providers like Children's Channel (Israel), TV2 (Norway) and FOX8 (Australia). There was mention of deals with Activision, Sony Pictures, Paramount Pictures and BlackBerry, but there were no details on what those agreements might mean.